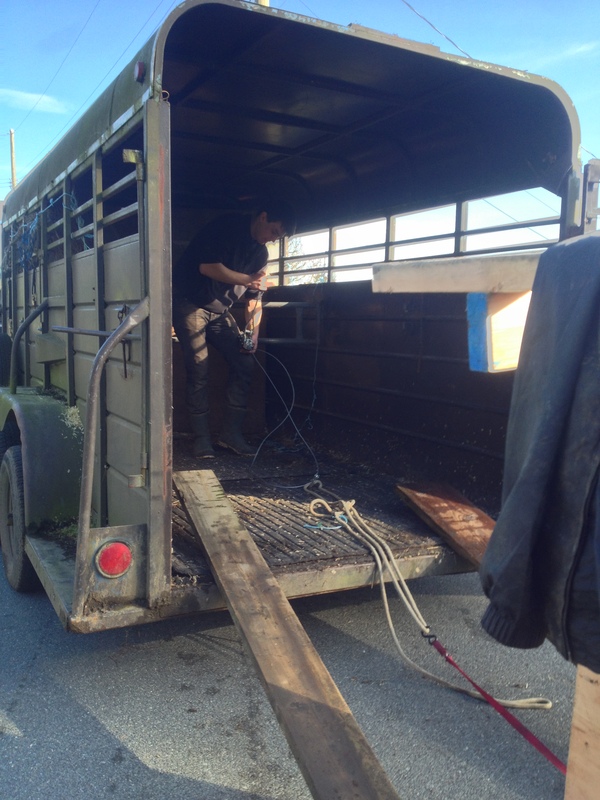 Shoehorning a Portable Hog Shelter Into a Horse Trailer – Where’s the Bear Grease? 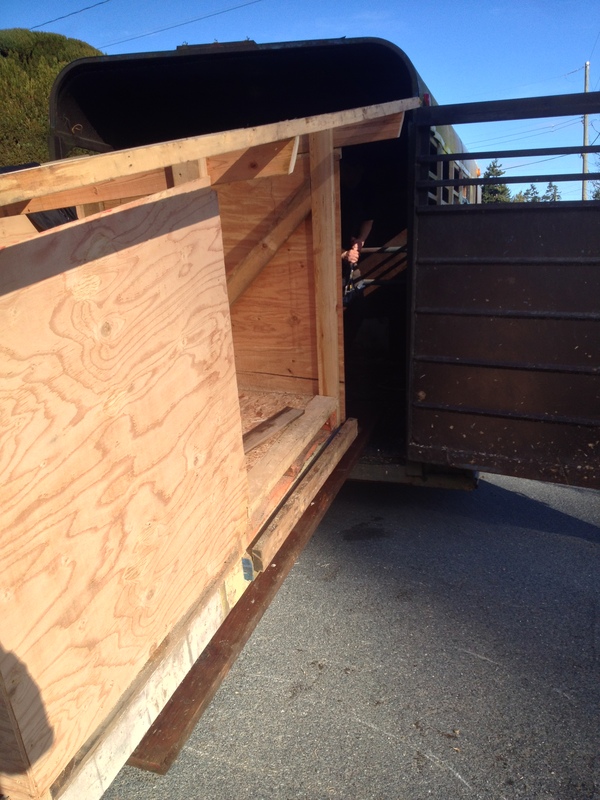 After building the most lovely of hog shelters, MC and I had to figure out how to move it up to the road and into a vehicle for transport over to the new hog field at Maypenny Farm. We hitched the truck to the ‘tow bar’ on the hog hut and dragged it up the hill. Easy peasy! The heavy duty runners (built out of posts that once held up our old deck) slipped over the gravel like an Olympic skier skims through powder. Maybe not quite like that, but it was way easier than I thought it was going to be and the next thing I knew I was zipping around the block to pick up the horse trailer. Hitching was a snap with MC giving extremely accurate and precise hand signals (in Germany, there’s some sort of license specifically for anyone who wants to haul trailers around… part of the prep for taking the license test involves learning a very effective hitching communications system…). Before I knew it I was back up on the road in front of the house and had backed the trailer up to the hog hut… I was humming at this point, smugly thinking we were ahead of schedule. Hah!! 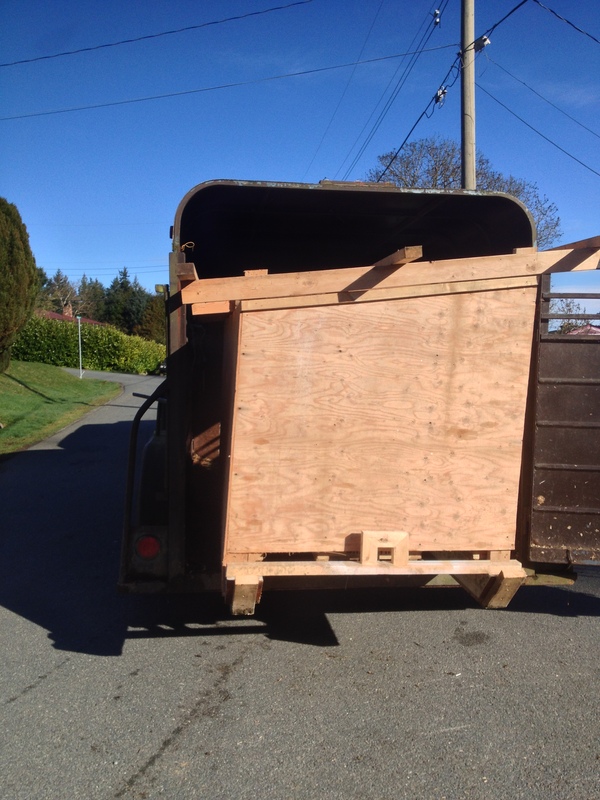 Even with the metal roof off, it was quickly obvious just how tight a squeeze it was going to be to shoehorn the hog hut into the horse trailer. If we had been lifting in something the size of a dog crate, we would have been laughing – a sixteenth of an inch on either side is plenty of wiggle room. When the structure in question weighs… well, a lot, it took some German ingenuity and lot of good humour to rig up a system to haul that sucker aboard. I kept finding myself thinking of the anonymous souls who used ramps and pulleys and levers and who knows what to build the pyramids and erect Stonehenge as we improvised a ramp using a couple of planks and attached a come-along to the tow bar of the hog hut at one end and the steel divider inside the trailer at the other. 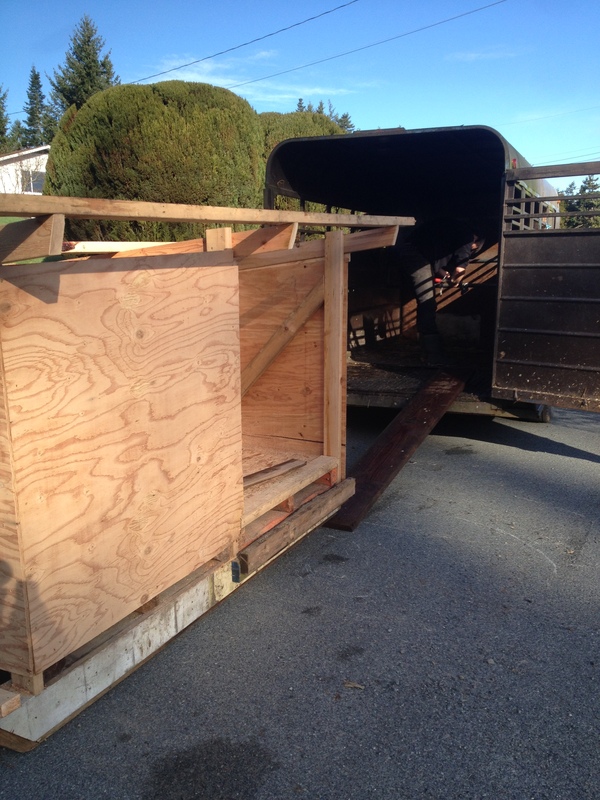 There followed an awful lot of pushing and heaving and ho-ing and grunting and levering to inch it up the planks until it wedged firmly against the back of the trailer frame. 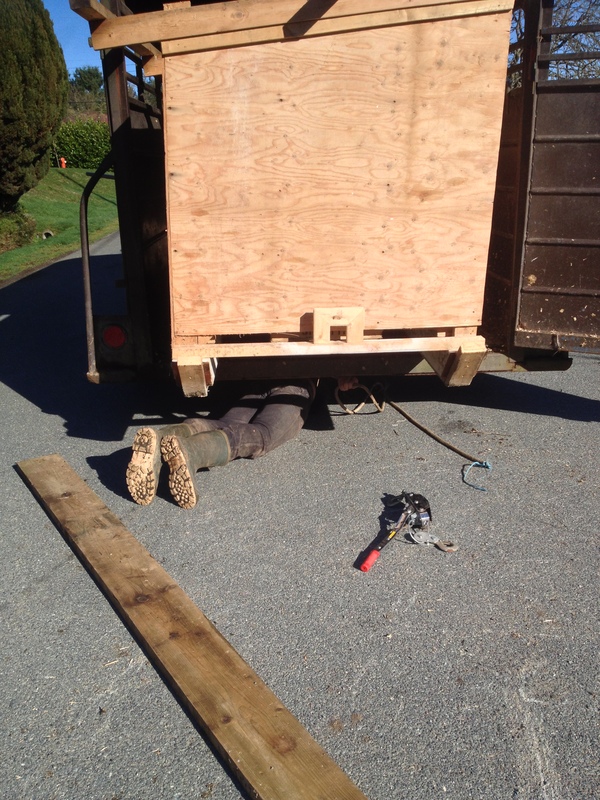 He was able to fasten the come-along to the underside of the trailer frame and with a bit of cranking and more shoving we were able to squeeze that thing inside and shut the door! We were no longer ahead of schedule, but we were on our way. Little did we know what traumas awaited us at the other end where, we learned, loading the hog hut was going to be the easiest part of a very long day. This entry was posted in Blog, Pigs, Uncategorized, workaway and tagged farm, horse trailer, humor, pig housing, portable hog hut, workaway. Bookmark the permalink. Who needs a gym when you can wrestle with a hog hut? Yikes, that sounds exhausting! And MC sounds like he’s worth his weight ( and height ) in gold! I was seriously considering hiding his passport do he can never leave…. I turned up the volume on my ipad to 11. I think the grunts and groans were audible. After reading this I have worked up a sweat. Whew! The simplest way to unload is to open the back door of the trailer, tie the hut to the nearest strong tree, rev up the engine full blast and pop it into gear. Presto! One extricated hut. What do you think? Love the hog shelter! Glad you have another way of moving it around the paddock. What a day.